With the latest update OnLive changes the login screen for the service, besides that there are no apparent changes, though some users are reporting better pic quality, but this can be subjective. The free space on the lower part is probably for some important service news and to keep the window size coherent, because of the welcome screen for new members and the free account screen. 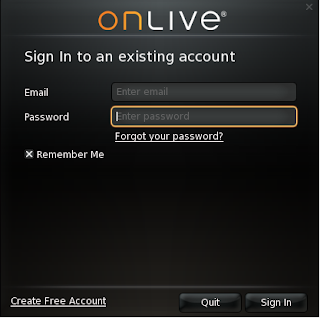 Account creation was also integrated in the new login screen, so users don't have to go to OnLive's page in a browser. 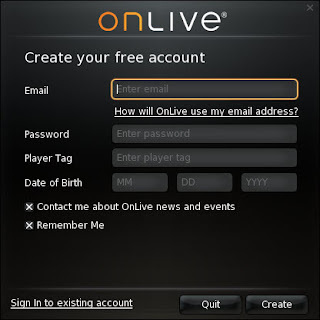 This is most likely because of OnLive's imminent launch on TV's, tablets, Blu-Ray players and other devices, this makes the OnLive service even more accessible. 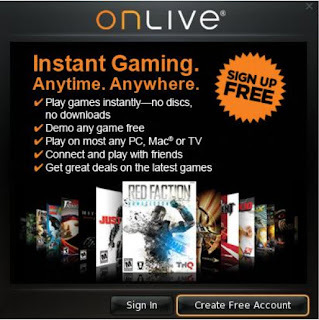 Also this probably has something to do with users of the OnLive MicroConsole complaining about the fact that they had to switch to a PC to register for OnLive. I wonder what all the blank space between the sign-in fiels and the buttons is for. Updated info about the blank space, create free account and welcome screen. I wonder what all tguild wars 2 key he blank space between theDiablo III gold sign-in fiels and the buttons is for. charge at a high price. After you have pay for it, practice in your game playing.